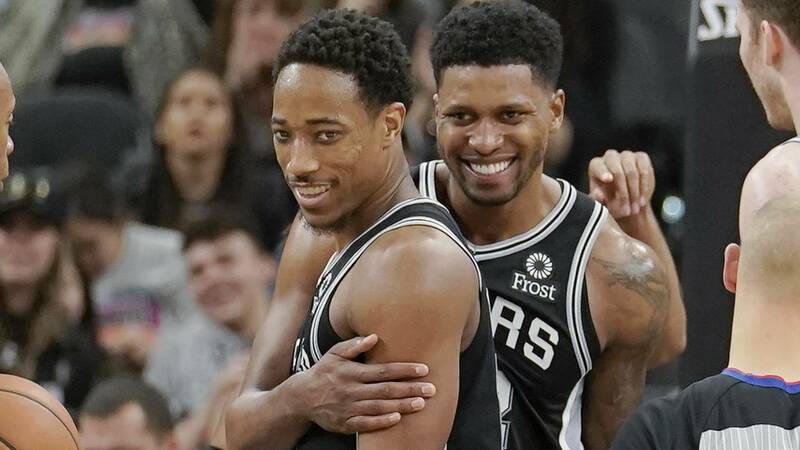 SAN ANTONIO - DeMar DeRozan had 26 points and eight rebounds and Rudy Gay added 23 points and 15 rebounds to lead the San Antonio Spurs to a 110-97 victory over the Utah Jazz on Sunday night. LaMarcus Aldridge scored 20 points for San Antonio, which won its second straight after dropping four of five. Spurs: San Antonio coach Gregg Popovich tied Pat Riley for fourth all-time in league history with 1,210 career victories. . Davis Bertans missed the game due to an undisclosed personal reason. . Dante Cunningham also missed the game, sitting out due to abdominal soreness. .. The Spurs previous low points by an opponent in the first half was 39 points, which happened twice.